Growing up in New York City in the 1970s, I came to love classical music, particularly music written for the piano. Though I never considered myself to be a “music student,” I started playing the piano in the third grade with a teacher who inspired me, and I used to spend my Saturday mornings browsing through records at Sam Goody or looking through sheet music at Patelson’s behind Carnegie Hall. I once played hooky from school with my best friend, Alik, to line up in front Carnegie Hall in the middle night with in order to buy tickets to see the great pianist Vladimir Horowitz, whom I would be privileged to hear live a number of times in the ensuing years. Alik could really play; his signature piece was Chopin’s G-minor Ballade. And it was he who introduced me to Beethoven’s Late Quartets. In retrospect, though, we both had a very conventional notion of what “classical music” was. If we’d been asked, we probably would have said that “classical music” was Western high-art music created roughly between 1700 and 1900 — or perhaps 1943 (we both loved Rachmaninov). I also understood “Classical” to mean the period after the “Baroque” (e.g. Bach, Handel, and Vivaldi) and before the “Romantic” (e.g. Beethoven, Chopin, and “Rach”! ), exemplified by Mozart and the early Beethoven. I accepted the conventional opposition between “classical music” and “popular music” (which I also loved: it was the heyday of the Stones and Led Zeppelin). That conventional notion of “classical music” went out the window years later when I began listening to Kronos Quartet‘s Pieces of Africa (1992), which would eventually top Billboard’s chart for “World Music,” a category that became popular in the 1980s as a marketing label for non-Western “traditional” music. Founded in Seattle in 1973 by violinist David Harrington, the Kronos Quartet sought to overturn the conception of “classical music” that I shared with so many other people. Harrington had apparently been inspired to form the group after hearing a radio broadcast of the avant-garde composer George Crumb’s Black Angels (1971), a work written for “electronic string quartet” that in which the players were required to use (in addition to their stringed instruments) maracas, water glasses, and paper clips (as picks) and to speak and make other vocal sounds. In 1978, the group had formed a tight collaboration featuring Harrington (violin), John Sherba (violin), Hank Dutt (viola), and Joan Jeanrenaud (cello). They became known not only for performing an unusual repertoire but also for eschewing the traditional dress code for string quartets, wearing clothes that recalled the styles of New Wave rock’n’rollers. They tried to create a special ambiance in their venues and often played in front of projections. The quartet gained international recognition with their 1987 album White Man Sleeps, which took its title from two pieces by the minimalist composer Kevin Volans that made use of harpsichords, a viola da gamba in African tuning, and Western percussion instruments. In 1989, the group’s recording of Steve Reich’s Different Trains won a Grammy Award for Best Contemporary Composition. Since that time, the trio of Harrington, Sherba, and Dutt has been joined by several different cellists after Jeanrenaud left in 1999 to pursue different projects: Jennifer Culp (1999–2005), Jeffrey Zeigler (2005–2013), and most recently Sunny Yang (2013 to present). By one count, the quartet has recorded 43 studio albums, two compilations, five soundtracks, and 29 contributions to other artists’ records. Along the way they would challenge not only the meaning of “classical music” but also the construction of the emerging construction of “world music” as something that was “traditional” but not “classical.” And they would seek to break down the boundaries between the classical and the popular, including arrangements of songs like Jimi Hendrix’s “Purple Haze” and The Who’s “Baba O’Riley” in their repertoire. That’s a good description of the music that Kronos has been making during its residency at the NYU Abu Dhabi Arts Center this week. 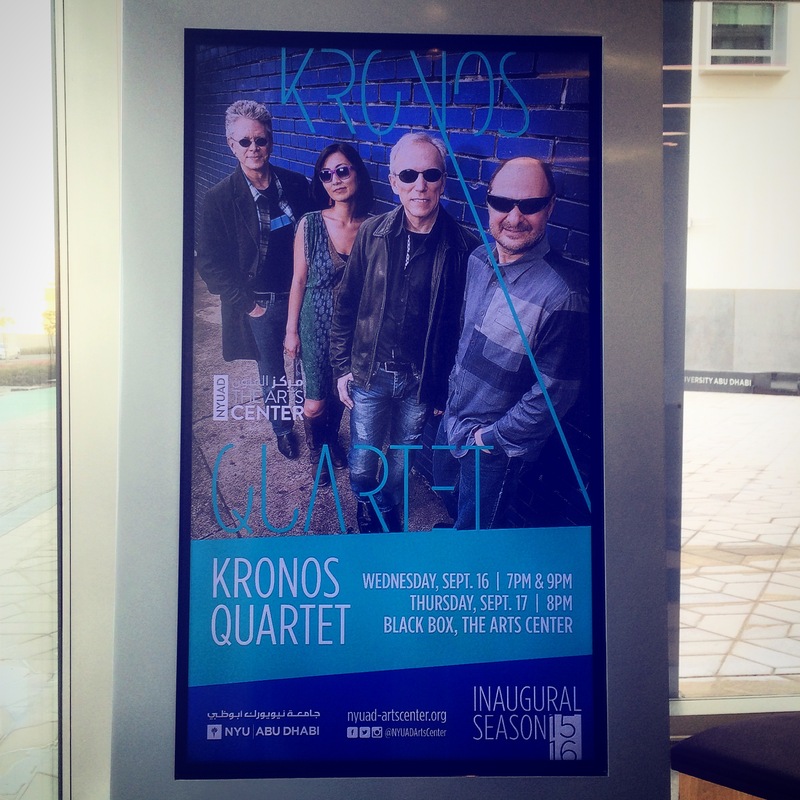 Kronos is presenting five shows during the residency, each featuring a different program, for a total of some 40 different pieces by composers from 27 different countries. All-terrain indeed! The first piece at the group’s early show on Wednesday, September 16 in NYUAD’s Black Box Theater was “Mugam Sayagi” by the Azerbaijani composer Franghiz Ali-Zadeh (which can be heard on the quartet’s 2005 album of the same). Yang carries her cello in the dark up a set of steps at the side of the platform stage and began to play the haunting cello refrain with which the piece opens. As the lights slowly rose to reveal her stunning red dress, one could also hear the strains of a violin floating from somewhere, seemingly outside the hall. The mystery is soon solved as the Harrington, Sherba, and Dutt join Yang onstage just before the piece explodes into its brilliant pizzicato section. Yes, Kronos knows how to make an entrance. The rest of the program featured “Oh Mother, the Handsome Man Tortures Me,” arranged from song by an unknown Iraqi composer”; “Escalay (Water Wheel)” by the Egyptian Nubia composer Hamza El Din; and “Good Medicine” the concluding piece from the cycle Salome Dances for Peace by the American composer, with whom the group has a long relationship. Indeed, the group has commemorated the composer’s 80th birthday by releasing a five-disc box set of its recordings of his work. Perhaps the highlight of the program came in the middle, the world premiere of “Sunjata’s Time: 3. Nana Triban” by the Malian composer Fodé Lassana Diabaté, who joined the group onstage, playing his signature instrument, the 22-key balafon. The piece was commissioned as part of the group’s “Fifty for the Future” initiative, which is designed both to commission new work for string quartets and also to train students and emerging professionals to follow and extend the path that Kronos has blazed. NYUAD is a sponsoring partner of the initiative, and the Kronos concerts at NYUAD feature world premieres of pieces by Diabaté and by the Chinese composer Wu Man. The NYUAD programs include the work of two other composers who have received commissions as part of the initiative, Franghiz Ali-Zadeh and Aleksandra Vrebalov. After the performance of “Nana Triban,” Harrington told the audience that it was a privilege to play with and learn from Diabaté, particularly because the final arrangement of the piece will be for string quartet only, with the balafon receding into the history of the piece’s musical evolution. On its website, the group indicates that “digital versions of the scores and parts, recordings, and other pedagogical materials for each work will be made available worldwide at no charge via the internet.” I’m hoping that archive will include versions of “Nana Triban” with balafon as well as without. You can get a sense of what kind of music Kronos is making at NYUAD by watching and listening to the following two videos, recorded at the Greene Space in New York. Both pieces — Nicole Lizée’s “Death to Komische” and Mary Kouyoumdjian’s “Bombs of Beirut” — are on the program for the final concert at NYUAD. Both Kronos and NYUAD share what I would call a cosmopolitan vision of the world, in which cultural difference is not a problem to be solved, but an opportunity to be embraced. It’s NYUAD’s goal to ask in all of its practices, “What does it mean to be doing this here (in Abu Dhabi and in the MENA region) and now (at the start of the twenty first century)?” If the NYUAD project is, in part, about rethinking past educational practices in order to revitalize them for the future, then it would be hard to find a better model for that kind of visionary thinking than the Kronos Quartet. Kudos to NYUAD Arts Center Director Bill Bragin for bringing them to Abu Dhabi as part of the Center’s inaugural season. Kronos Quartet Research Guide (NYUAD Library): Click here. 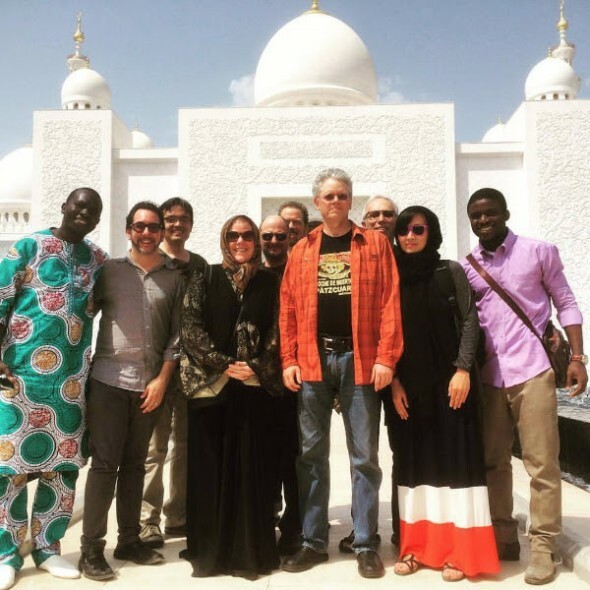 Diabaté, Bragin, Kronos, and friends at the Sheikh Zayed Mosque in Abu Dhabi.